Someone really close to me made a massive, uber courageous change a couple of weeks ago. It was a biggie! They thought long and hard about this change, and wanted to make it for a really long time. Once the opportunity presented itself to take the leap, they took it. Were they afraid? Of course, change can be scary. Were they worried they were making the wrong decision? No, because they felt it so strongly in their gut and it was scarier to think about how they would feel if they didn’t do it. 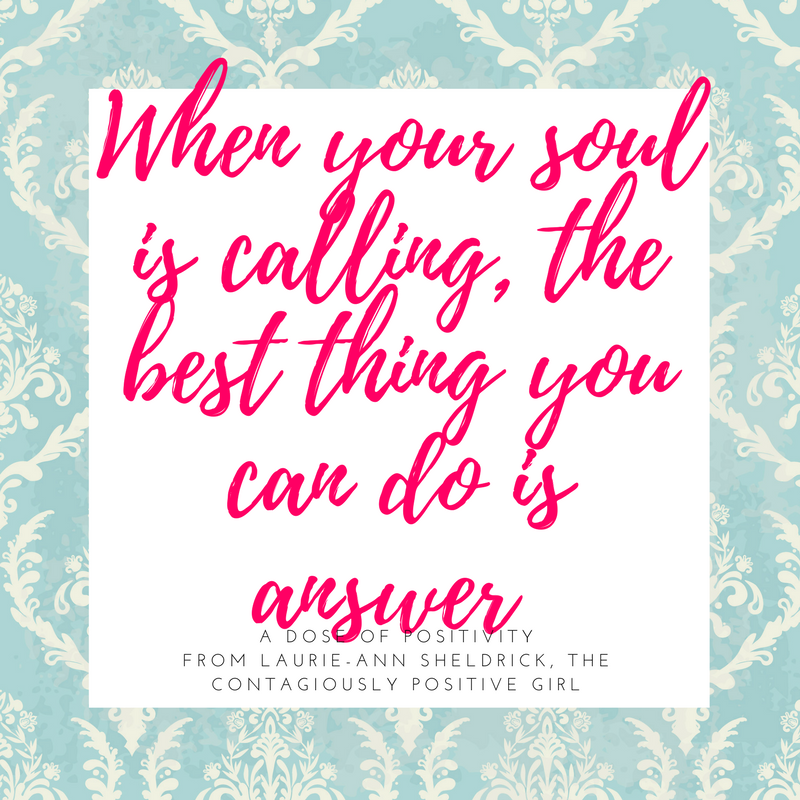 I absolutely love this because when our souls are calling, the best thing we can do is answer. Here is my unleash your inner contagiously positive challenge for the week. If there is a decision weighing on your mind, or a choice you really want to make, or a change that you have just been itching for, DO IT. Don’t wait. Start to put the pieces together to make it happen. Talk to whoever you need talk to. Plan whatever you need to plan. List out the steps if there is more than one. Don’t wait until you find yourself saying, “I wish I would have done that sooner.” Or, don’t wait until you find yourself in a place where you haven’t done it at all, feeling full of regret. If you are feeling scared, listen to and trust your inner guide (your gut). You know best. You always know best. In my book, Unleash Your Inner Contagiously Positive, I write an entire chapter on fear. One thing that I touch on constantly is that fear is normal. We all feel it. We just don’t need it to be our decision maker. Have faith that once you take the first step the fear will lesson. Fear is a worry of the unknown…a what-if . Once you take away the what-if out of the equation, you start to wonder, “what the heck was I ever afraid of.” The only way to take the what-if out of the equation is to meet your fears with faith and do the things that you really, really, really want to do – the things that your inner guide is screaming at you to do. You can be afraid at home, feeling falsely protected in your fear bubble, or you can be afraid, do it anyway, and be out there living a fabulous, purposeful, fulfilling life. What will you choose? The choice is yours.